The Buena Vista Social Club: "Chan Chan"
In 1999, Ry Cooder coaxed several Cuban musicians out of retirement to record an album. The project was filmed by Cooder’s friend Wim Wenders (the director of Wings of Desire). The players ended up performing as The Buena Vista Social Club in Amsterdam and at Carnegie Hall in New York City. Compay Segunda’s Chan Chan was perhaps the biggest success. Ruben Gonzalez’s Mandinga also is great. 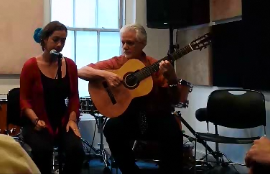 Here is more pretty music from Cuba: La Familia Velera Miranda plays Puro Son en Concierto, Igor Arias Baro, Julian Chang and Yuniel Jiménez perform Besitos in New York City and a Changui Guantanamo group presents a tune that doesn’t appear to be named. One Cuban who came to the states and became famous is Arturo Sandoval, who played trumpet with Dizzy Gillespie for years. Here the two performs Gillespie’s A Night in Tunisia in Havana in 1985. The best known Cuban-born American entertainer is Desi Arnaz, who of course was married to Lucille Ball and starred in I Love Lucy. Here he performs Babalu. Which Are the Best Rock Songwriting Duos?